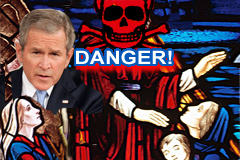 What's with George and the National Catholic Prayer Breakfast? Our founding fathers included a specific separation of church and state for many good reasons. Women should be outraged by this misuse of public office.